Bangalla is one of sydney's exceptional residences, situated on Scotland Island, an absolute peaceful serene holiday destination, nestled in the heart of Pittwater, this secluded retreat is just 45mins drive from the CBD. This stunning waterfront property, has its own private beach, and easy boat access with two jetties, it is set on 2 acres of very private, manicured grounds with spectacular water views. The original sandstone cottages, built around the turn of the century, from locally quarried sandstone, have been lovingly restored and lavishly appointed by the present owner. The main cottage boasts a master chef kitchen, spacious living/dining areas, master bedroom suite, second bedroom and many outdoor entertaining area's, all with sensational views. The cottage is air conditioned and made cosy by 3 fireplaces, it makes for the perfect romantic getaway. The second cottage, a guest house beautifully built by a master craftsman in teak timber, features queen bed, kitchenette/living, bathroom & outdoor deck. There is a heated freshwater pool & sauna, with a large entertainment pavilion. There is plenty of room for the family or friends. 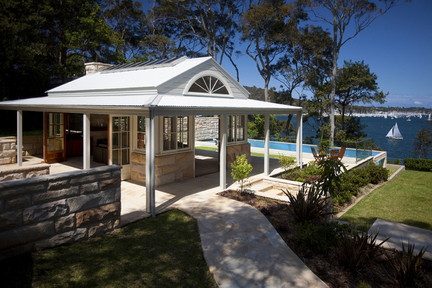 The Cottage's elevated position give it amazing views, take in the serenity with the picturess Pittwater and the Barrenjoey Peninsula , you can watch the yachts sail by your doorstep. The somnolent beauty and tranquility reigning over Pittwater is magical. A place where you can retreat and watch the world go bye, or partake in the many water sports/activities and local attractions Pittwater has to offer. Pittwater has a host of marina's with excellent boating facilities and offers endless boating opportunities and also great fishing. Explore the many quiet bays and anchorages of this world renowned waterway, bounded entirely on one side by the Kuringai National Park. Bushwalk the parks many trails for breathtaking scenery and experience its unique flora and fauna. Scotland Island is only 3 minutes by boat to Church Point and a fast tender is available to licensed guests. All the facilities and shopping of the northern beaches, including some of Sydney's best restaurants are only minutes away. The Island is serviced hourly by ferry or a water taxi service, which can take you anywhere in Pittwater in just minutes.